In addition to your rainwater tank, there are other plumbing parts and accessories you will need to set up. If you are installing a rainwater tank for the first time in a new home, then chances are you will have little to no idea about what you need. 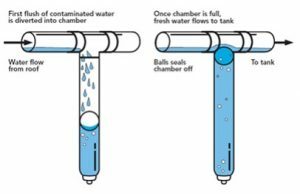 This article will help you understand the main tank fittings and accessories needed. Tank Overflow – located at the top of your tank, this hole allows excess rainwater to drain out of your tank when it is full. outlet extension and high-quality valve for tank outlet – ensure quality brass fittings comply with Australian Standards AS 3688V to ensure no zinc leaches into your rainwater. piping to direct water from the tank overflow into underground stormwater drains or into another storage tank or an underground tank used for stormwater detention. To help prevent debris, mosquitoes, frogs and vermin finding their way into your rainwater tank, you will need appropriate screening on all points of entry. On top of your water tank where rainwater enters you should have a leaf strainer approved for food contact with an aperture that prevents mosquitoes from entering. The water overflow of your tank should also be screened since mosquitoes, insects and frogs could otherwise find their way up your tank’s overflow pipe. If you want to have your rainwater connected to a tap other than your water tank, then you will need a pump. You should also ensure your pump comes with a cover to protect it from the weather. Water tank pumps ensure adequate pressure throughout your property whether that is in irrigation systems, hosing such as washing your car and watering gardens, toilets, washing machines or topping up water in your swimming pool. Most pumps supplied with tanks make use of your mains power. If you are located in a bushfire prone area and you are required to detain water for bushfire fighting purposes, then you will normally need a pump that can function without mains electricity. Having a rainwater to mains water switch allows rainwater to be used as your primary water supply. When your water tank is running low on water then you can switch over to your mains water supply. Switching can happen automatically or manually and it depends upon the system you purchase. If you are plumbing in your rainwater tank to be used in your laundry, toilet, shower and/or for drinking, then you ideally want an auto-switching device. This will ensure that you have a reliable water supply. Device manufacturers claim you can reduce your mains water usage by 40% or more when a rainwater to mains auto-switching device is connected to a well plumbed rainwater tank. “First flush” rainwater diverters help to improve the quality of water entering your tank. When it rains, the initial litres of rainwater can contain debris and other contaminants. Diverters work by preventing this first flush of rainwater from entering your tank. The rainwater diverter system is comprised of a downpipe of several metres length that is installed along the pipe running from your gutter to your water tank. When it rains, the first litres of rainwater flows into and fills the down pipe. A slow release valve at the bottom allows the dirty water to slowly drain. A float ball inside the pipe rises as it fills with rainwater, sealing the top of the pipe and allowing the fresh rainwater to run on into your tank. The amount flushed will depend on the length of the pipe attached to the diverter – 1m of 100mm pipe will hold divert approximately 8 litres of water.